My heart goes out to the victims of the bomb blasts (and their friends and families) in Boston. This post is in honor of the marathoners and their supporters who needlessly lost their lives and limbs in this tragic event. 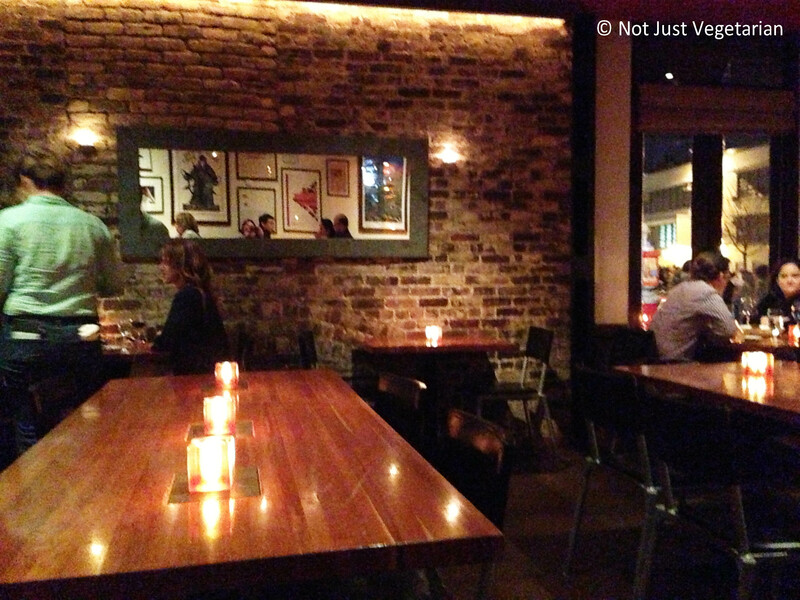 I have wanted to go to Hearth for a long time, but was scared (no, terrified) of being denied a table there. Imagine my excitement when our friends booked a table there for a dinner on a Saturday at 8.30 PM!! I love the name “Hearth” – feels like it should be the place to go to on a cold, wet, windy, snowy night (we have had a few this past winter in NYC, haven’t we?) to hang out with friends and family. The food is comforting and the place is large, yet Hearth feels warm because of its friendly and welcoming service. 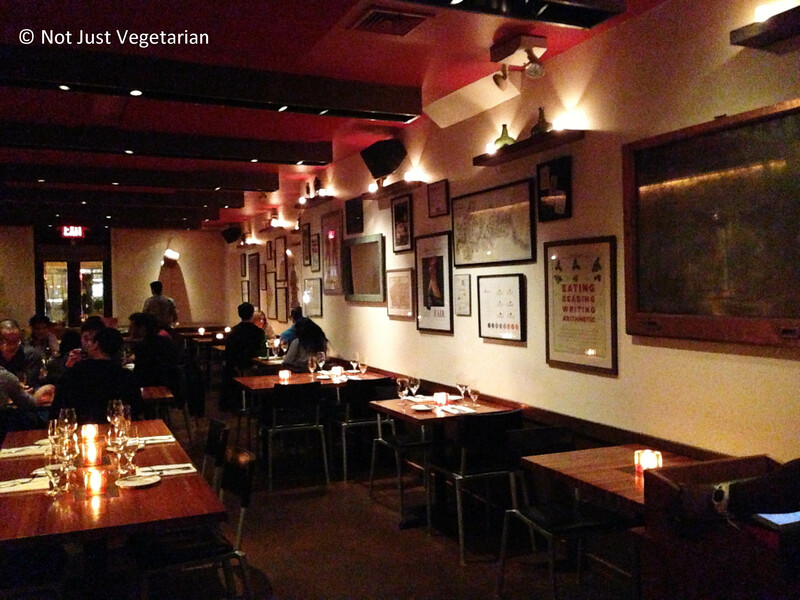 Executive Chef Marco Canora helped open Craft in NYC before starting out on his own at Hearth. I was told (by my well-informed friends) that Hearth is “Craft quality with better prices”. The restaurant is large enough to accommodate walk-in guests (which we were, because, it turns out that my friends had a reservation for dinner exactly 4 weeks from the day we went), so my fear (about denial of a table) was completely unfounded. The menu at Hearth changes daily and features classic American dishes that have been given a contemporary spin with Italian cooking techniques. 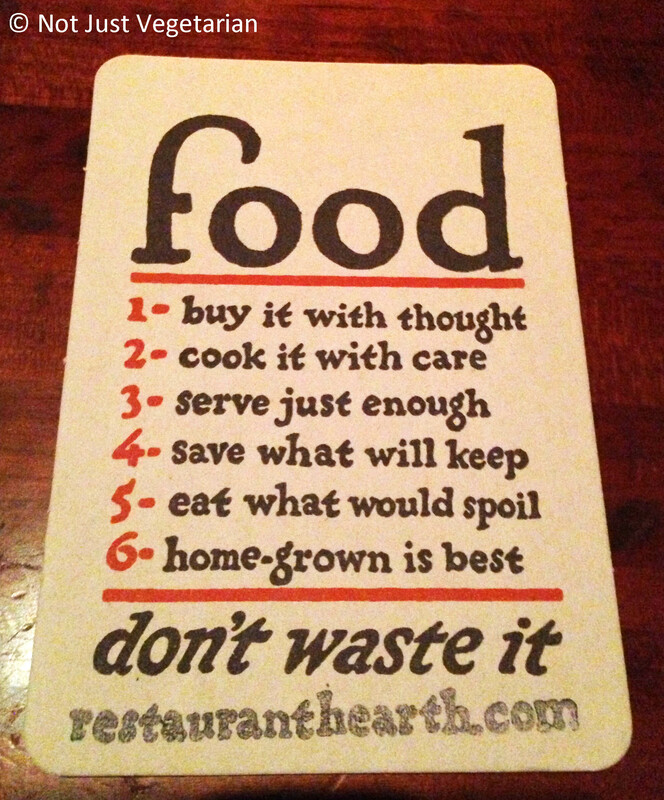 Hearth’s philosophy about food is listed on their coaster – see picture below. Despite their philosophy, I think their portion sizes are large. The creators of Hearth – Chef Marco Canora and General Manager (and the Beverage Director) Paul Grieco also manage Terroir (wine bars in several locations). Needless to say, the wine list at Hearth is very impressive. Our friends had ordered the wine by the time we got there and their choice was excellent. All I remember was that it was a Pinot Noir and we all loved it. We ordered from the new spring menu (changes daily). The Chef de cuisine is Jordan Frosolone and he makes extremely delicious food. Some of the dishes that we ate were – ricotta sformato, grilled quail, smoked chicken breast, olive oil poached salmon, a pasta in a pork ragu, and along with a couple of sides – sauteed rapini (broccoli rabe) and hen-of-the-woods mushrooms. The ricotta sformato came with grilled asparagus and extremely thinly sliced parmigiano. I have never had sformato before – it’s a mousse-like / souffle like dish but not as airy or light – according to this post – and it was exactly as described. A friend got the olive oil poached salmon. When we were ordering this dish, the server mentioned that it looks medium rare but is cooked through. 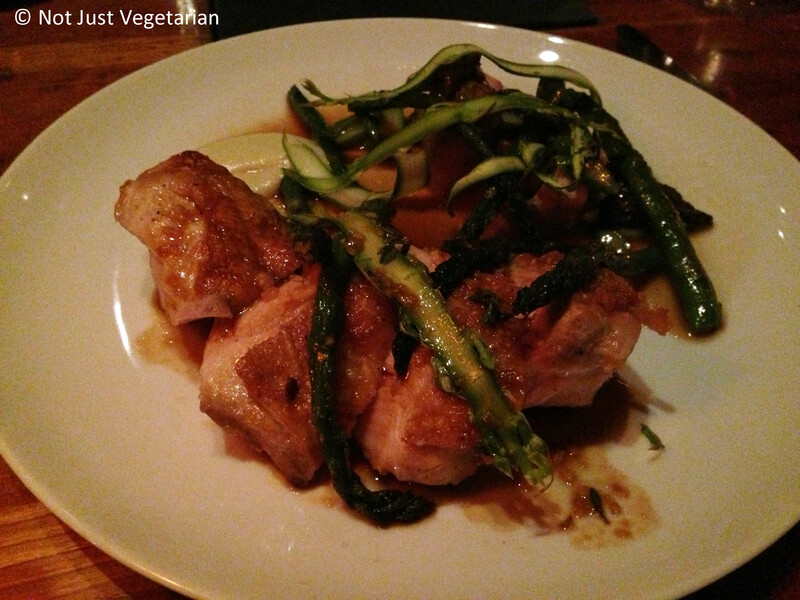 This dish was plated beautifully – the picture below does no justice to this dish. The salmon looked rare, almost like sushi grade salmon. The salmon was cooked through just as the server mentioned it would be. 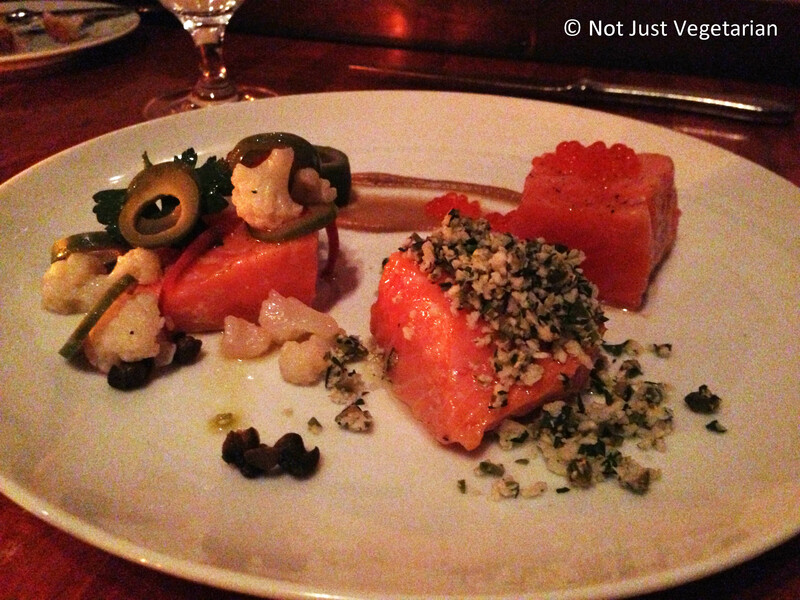 The sliced olives and the trout roe were a wonderful savory flavor contrast to the salmon. This is one of the best cooked salmon dishes that I have ever tasted. I would get this dish again. I got the roast smoked chicken breast and thigh. This was a very large portion – almost 3 times as large as the salmon entree. I loved the thinly sliced grilled asparagus that accompanied the chicken – was an asparagus over load for me, but I did not mind it that evening. I liked this dish, but will share it with someone if I get this dish again. We got two side dishes. 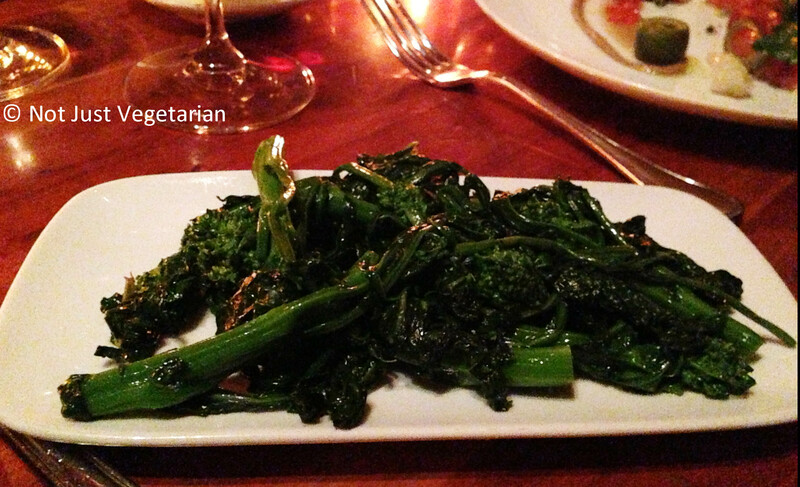 The sautéed rapini (broccoli rabe with peperoncini) was nice, but would have tasted better with more salt and more peperoncini. Hearth serves many after dinner drinks. We skipped desserts in favor of after dinner drinks. Hearth serves coffee from La Colombe Torrefaction (more on that in another post). Most of us got tea, while a friend got buttered rum. I have never had buttered rum before, and I am now a convert. It was sweeter than I imagined it to be and not that the sweetness was a problem. The intensity of the rum was tempered by the butter, the sugar, and the spices and made me want to try more than my fair share of my friend’s drink but I stuck to my chamomile tea. Again, no picture here, sorry! The pork ragu (in the pasta dish that one of our friends got) had something that felt thin and sharp and was about 2.5 inches long. A ragu should never have something sharp as sharp as this object. We were debating whether it was a bone or a toothpick or a rosemary stick. Turns out that it was a rosemary stick. The waitstaff were very apologetic about this incident. Overall, the food (large portions) and the service at Hearth were great, although the vegetarian and vegan options are limited in the menu. 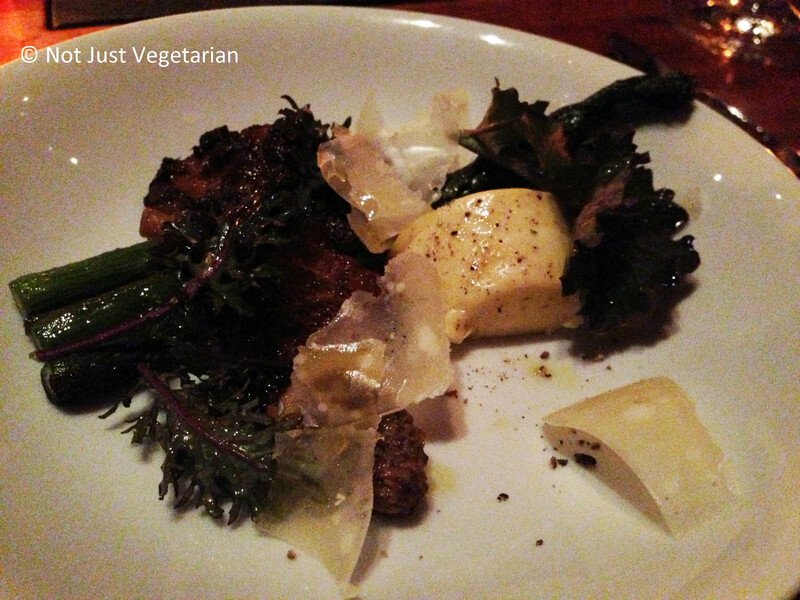 But then again, the menu changes daily, so take a chance and go to Hearth and tell me what (vegetarian) you ate there.